The high winds of Hurricane Katrina managed to displace two large oak trees in St. Anthony’s Garden behind the Cathedral, dislodging 30 feet (9.1 m) of ornamental gate, while the nearby marble statue of Jesus Christ lost a forefinger and a thumb. 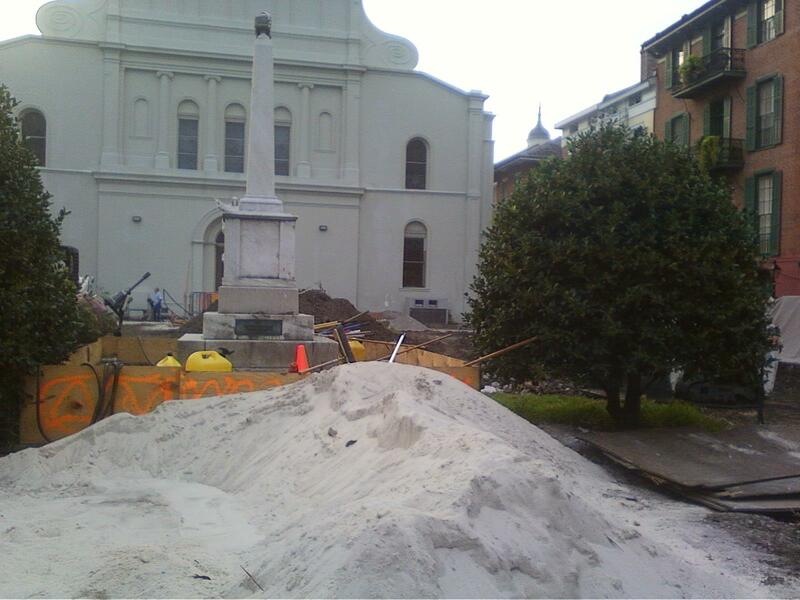 Restoration of St. Anthony's Garden at St. Louis Cathedral.. The garden restoration is finally underway….This video link tells its fascinating history (albeit a bit hokey with the fuzzy recreations) and about 14 minutes in, tells about the dig that started the restoration. Nice to know it was a flower market at one point, and how many toys they found in the excavation…And that the earliest structure in the French Quarter ever found in a dig was uncovered. And that fruit trees and native plants are being used. This entry was posted in architectural features, block information, ecology of place, jackson Square, old New Orleans and tagged archaelogical digs, St. Anthony's Garden, St. Louis Cathedral.